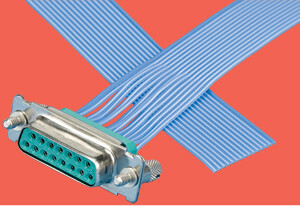 Connector to cable HV ribbon cable assemblies are fitted with stainless steel / DAP2 subminiature D connectors at one end and non terminated, Teflon® insulated ribbon cable at the other. These components are suitable for vacuum applications down to 1 x 10-8 Torr with a maximum temperature of 125°C. The female cable connectors mate directly onto the vacuum side of subminiature D feedthroughs or with the male in-vacuum cable connectors. The ribbon cable jacket is an extruded FEP Teflon®, the conductor is 28AWG silver plated copper, stranded 7 x 0.127mm. Contact to cable UHV ribbon cables do not include connectors. • 7 x 0.127mm (28AWG) wire ribbon cable. 2 – DAP is a glass filled dyiathilate.